Our show is easy to get to by road from all over the North, and from the Midlands too with York (the City) and the Racecourse fully signed with both permanent and temporary event show signing. However we strongly recommend that all attendees follow the temporary event signing to the venue. These signed routes may not be the shortest but they will help you avoid congestion in York City Centre. All A1036 - Once on the A1036 head into York. 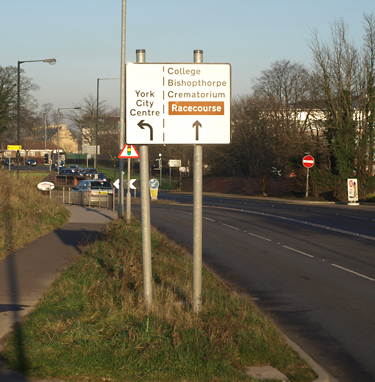 The road layout and signing after leaving the A64 changed in 2011 and again in 2015 with the opening of the Askham Bar Park & Ride site. Older sat nav maps and directions may therefore differ from current road layout/signing. Traditional route - After the first set of traffic lights by the petrol station stay in the left hand lane and follow the formerly signed route, now with City Centre signing (Photo if required) until you see the grassed, open area of the Knavesmire on your right. At the foot of the dip turn right onto Knavesmire Road and approach the Racecourse area. Currently signposted - after passing the Park and Ride site take the right hand lane and follow the currently signposted route to the Racecourse. You will be on the green route as per the map above. Carry on over the A64 bridge, then turn left into Church Lane, left again into Bishopthorpe Road and after passing the former Terry's factory building left again into Campleshon Road. The routes to the Racecourse via the York Inner Ring Road are not recommended although they can be used for access if you know the route. Parking in South Bank. Several areas are now Residents Only but are not required; please use the signed, free, car parking. As expected York Racecourse have their own web site. including an interactive guide to the course and buildings. Unfortunately their new interactive map is less useful than the previous pdf for visitors to non-racing events. The former printable version of these notes has become obsolete and therefore is withdrawn. As you are reading this page on-line it is assumed you have internet access. It is recommended that you check these traffic management advice services for the latest information on the day. Highways Agency live traffic feed service. The AA Roadwatch page link for national traffic news. On street parking in the South Bank residential area of York is tight but you don't need to use it. Parking for over 800 cars is available free of charge. Disabled parking will continue to be available on Racecourse Road close to the main entrance to the Show. SATURDAY - Visitors travelling to us by car on Saturday should note a major car boot sale is scheduled to be held using one of the main racecourse car-parks. Unless signed otherwise "on the day" the Saturday car parking is expected to be on the Knavesmire with access from "the Triangle". Unless you have a disabled persons badge please do not attempt to park behind the stands on Saturday as there will be no spaces available. Please park where advised by the staff on duty. SUNDAY & MONDAY - On the Sunday and Monday the larger Car Park should be available which is much closer to the Show. On these days please do drive along the road behind the stands to this park. Please park where advised by the staff on duty. Park and ride options - If you are traveling to York with a party including non-model railway orientated members you have the option of using P&R into the City and then the Show shuttle bus out to the Knavesmire. (Visitors from the north or north east - The service from Rawcliffe Bar drops off/picks up at the NRM and in Station Avenue. Alternatively park in our free car parking facilities and the remaining members of the party can use the Show link into York. Visitors from outside the N/N East should note that the A1237 York outer bypass (Northern section) and the A64 at the Hopgrove Roundabout both get very busy at peak/holiday times. Link to York City Council Park & Ride page.